Thanks to many years of experience we know that each participant of our course is different and has different requirements. 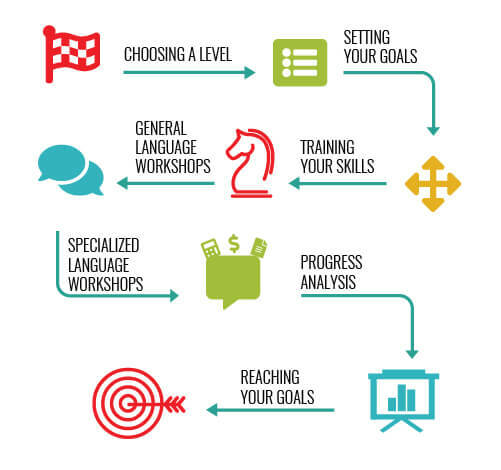 This is why at Speak Up we offer three options to choose from to begin the intermediate course. Our course is above all focused on practical language usage. This is why we offer many different classes and freedom of choice. One-to-one consultations with a teacher – up to 30 minutes. Mixed – you can do classes both at school and online. Online Classes with a teacher are recorded so you can replay them any time! With ease, you can talk about many topics: work, school or leisure. You can deal with most situations likely to arise while travelling and which require the usage of English. You consistently speak on topics that you know and like. You describe experiences and events, dreams, hopes and aspirations. You can explain your opinions and plans. You can describe feelings, emotions and attitudes. Talking about your childhood memories in English? No problem! With pleasure, you will talk about literature, theatre, travels or technological advancement. You can explain how to operate various devices. It is easy for you to express assumptions in English. You can talk about the media and advertising. You can express assumptions and give advice. You can provide reasons for being unsatisfied with a service. You can talk about discoveries, research and past achievements, you describe people, places and events. In informal conversations, you can express your opinions on current events. Environment, government, politics and finances? – for you it’s easy! You can conduct a conversation in English! You can start, maintain and conclude a simple conversation. You can express your opinions on different lifestyles, subcultures and cultural differences or talk about climate change and natural phenomena. Conversations about future trends? – Sure! You can read and understand announcements, interpret meaning, express sorrow and regret. You can express your opinion on subjects connected with films and TV. You can describe ailments and health problems. You can talk about experiences with education, converse about sport – both professional and every-day conversations. Conversations on topics connected with employment and future are no problem for you. Abstract topics are not a problem for you. You can describe feelings, emotions, plans and hopes. You can share your experiences in detail and provide precise information. Conducting a conversation, developing thoughts, formulating clear statements, expressing your opinion and discussions are easy for you! You can express and fully justify your opinions. Banking and finance topics are no problem for you! You can express certainty, possibility and doubt. You can react, express interest, compassion and surprise. You can use colloquial expressions. You can rate and review. Awesome! Idealne dopasowanie kursu, bałam się, że na zajęciach spotkam osoby, które dopiero się uczą, ale grupy były świetnie dopasowane. Uczyłem się angielskiego łącznie 10 lat i ciągle bałem się mówić będąc na tym samym poziomie. To się zmieniło w końcu przestałem się bać rozmawiać w tym języku. Interesting classes and very active Students Club, that’s what motivates me to keep learning. Speak Up is a great place to learn and have fun. I can do classes any time I want and never miss them, I love it!